Gadget Guide Week 2 | OhGizmo! By David Ponce on 11/20/06 • Leave a comment! Just a quick heads-up to let you know that my second article is up on Federated Media’s Holiday Gadget Guide. This time, I wrote about Tokyoflash watches. For those of you that somehow aren’t already aware of this company, you should know that we have this little crush on them. 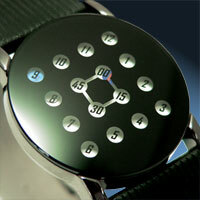 They make amazing geek timepieces, and I think they’re a must-buy Holiday present. There are also some other interesting posts up on that site, like the open source MP3 player, written by Phil Torrone, of MAKE fame.